I made the chocolate chip cookies without any modifications, except I only used 1 cup of chocolate chips because that’s what I had. Interestingly, this recipe doesn’t call for any fat other than the yogurt. I wondered if I would regret not greasing the (nonstick) sheet, but they came off pretty easily. 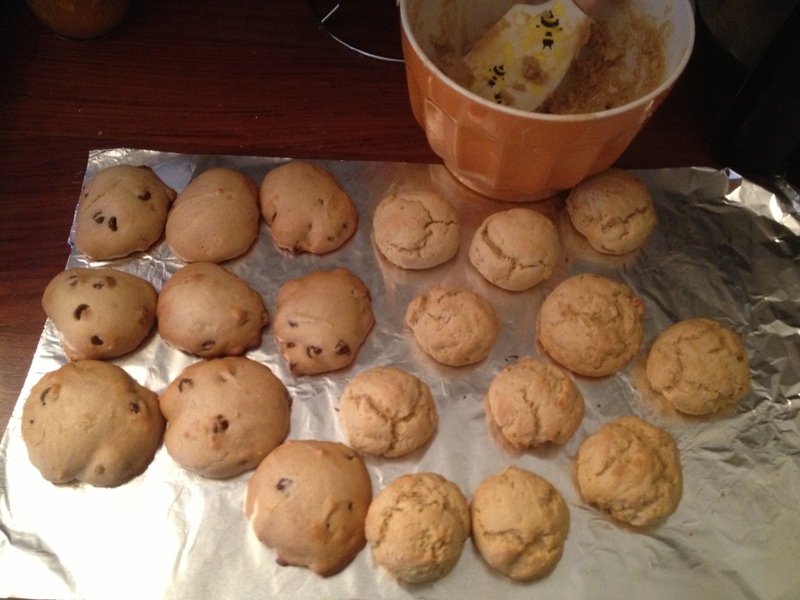 The dough is very elastic and the cookies puff up into a spongy, quick bread texture. For the second round I put a tiny pat of butter under each cookie and also added some cinnamon. The butter created a slightly crispy, salty bottom but it wasn’t necessary. With more Greek yogurt to use, I next made the brown sugar cookies. I used 1/2 cup butter and an extra 1/2 cup yogurt because 1) I wasn’t feeling up to putting two sticks of butter in a single cookie recipe and 2) I had a lot of Greek yogurt to use. These cookies were essentially the same as the first recipe; a little more biscuity and without chocolate of course (so a little on the boring side), but I’m sure they would have flattened out and crisped up (like the sugar cookie I was hoping for) if I’d used the full amount of butter. Chocolate chip on the left, brown sugar on the right. With more daylight and, remarkably, more energy (it’s been a long week!) I tackled another project: repotting two of my plants. One is a marble queen that Susan gave me for Christmas – which needed to be repotted way back then – and the other is a precious spider plant I’ve had since the fourth grade that hasn’t gotten a new home in years. Meeting for the first time for a nice, cool shower. I bought two new big pots for them so now I have two medium-sized pots to upgrade some other plants, sort of like snails swapping shells. I also cut about 25 babies off the mama, so if anyone wants a spider plant, let me know!